Bay Area Blowout! S.F. Tops Oakland 9-2! Under the lights in San Francisco, Oakland wasn’t far from home, but the bus ride back across the bridge felt like a transcontinental flight after a 9-2 beating from S.F. Pitching and defense made the difference in this contest as S.F. pitchers struck out 9 Oakland batters, dominating Oakland’s stacked lineup. Oakland pitchers, on the other hand, surrendered 19 hits, 14 of which were singles, while striking out only one batter. Oakland’s defense didn’t help matters much either as first baseman Billy bobbled two sure outs and Oakland’s outfield couldn’t seem to flag down anything. Luck was also on S.F.’s side as a bevy of bloopers fell for hits throughout the game. Oakland hitters seemed to hit the ball hard, but always at someone. Click here to read more and see highlight of the game! Boston’s hopes of holding on started to wane in the ninth inning as Atlanta seemed to have Boston closer Mark’s number. With the score at 6-5 Boston, Atlanta opened the inning with a single from speedster Carlos, who wasted no time in stealing second. Things started to fall apart after that though as Carlos failed to steal third on a strike two pitch to Harry, then got caught stealing third on strike three as Harry couldn’t lay down the sacrifice bunt. The double-play, however, didn’t end Atlanta’s threat as the power hitters Scott, Rod, and Marty, with a combined 90 home runs on the season, could tie the game with one swing of the bat. A single by Scott, followed by another from Rod, gave Atlanta runners on first and third with Marty coming to the plate. 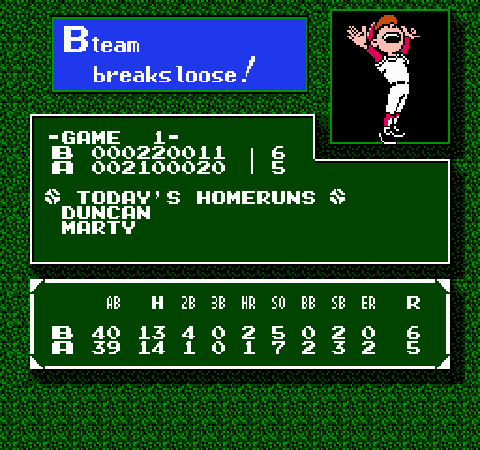 Marty, who had already hit a home run earlier, seemed to have the upperhand against closer Mark, who was clearly fatigued facing his fifth batter of the inning. “All I could do was throw strikes and hope we could get him out,” said Mark. Fortunately for Boston, that’s exactly what happened as a pop out ended the game. After a rainout yesterday, the player were eager to get back on the field and play ball, and did they ever. In the first ever Bad News Baseball night game, the atmosphere was electrifying. It seemed nearly every fan walked away with a home run ball as 10 balls left the field of play, with three players going yard twice (Casear, Gordon, and Bert). L.A. was in true form tonight, swinging for the fences and rallying comebacks. Minnesota, better known for their speed, was crushing the ball as well, matching L.A.’s power every step of the way. 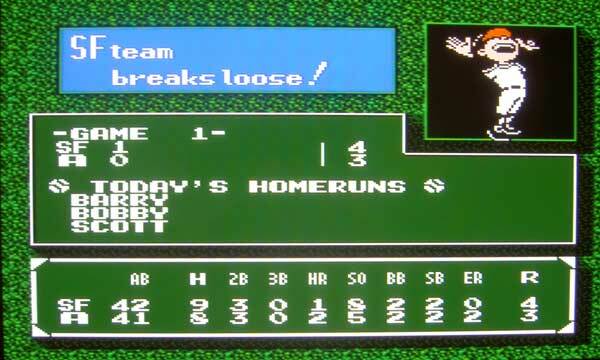 In a game featuring 5 home runs and 15 hits for each team, 4 lead changes, and ninth inning heroics, it’s no wonder this game went into extra innings. Super Finish to Friday’s Allstar Matchup! This Friday’s Allstar had the look of a blowout with 3 first inning runs by team Ultra. 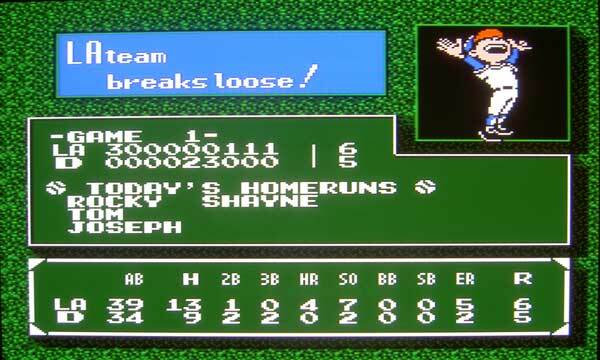 But it ended much different than it started as Davey’s Super team inched their way back into the game before Chris delivered the final blow in extra innings. Dominant pitching kept offense to a minimum after Rocky’s first inning 3-run homer for team Ultra. While Ultra’s strikeout count kept mounting, so did their pitch count, and a couple bad pitches made the difference in the contest. Davey ran his win streak to 2 today, as he led L.A. to a 3-2 victory over Tim’s Chicago club. 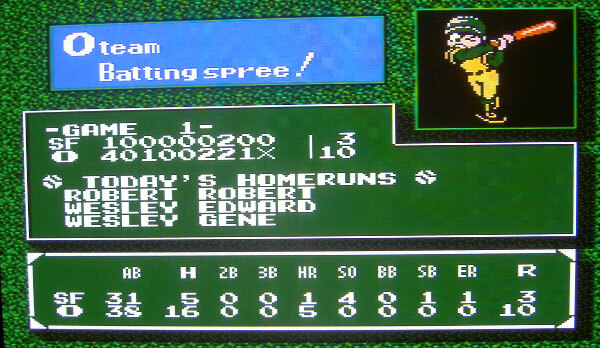 The game, which featured no home runs, was a defensive grudge match. L.A. struck first with a run in the first, but Chicago bounced back with runs in the fourth and sixth. They took the 2-1 lead into the eighth, but a lead-off hit by Tom started a two-run rally that proved to be the deciding factor in the game. While each team only struck out once, both pitching staffs managed to get hitters to ground out often. The bullpen was kept busy for both teams as nearly every pitcher saw action today. One strategic move made by Davey, was to intentionally walk slugger John. Then, with a fresh pitcher on the mound, he got Brian to ground into a double play. 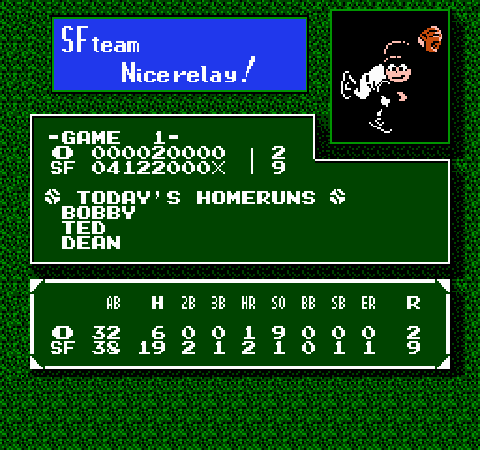 Led by Robert’s first inning grand slam and some stellar pitching, Davey’s Oakland sluggers blew past S.F. 10-3. After S.F. manufactured a run in the first, Oakland answered with three consecutive hits before Robert blasted a grand slam to left field, blowing the game wide open. Wesley added a solo shot in the sixth before Robert and Wesley both went deep again, this time back-to-back in the seventh. S.F.’s only home run came in the top half of the frame with a two-run shot by Edward in a brief comeback attempt, bringing the score to 7-3. “We’ve got a lot of respect for them,” said Davey, “You’ve got to get to them early and we were lucky enough to do that today.” Luck had little to do with Oakland’s rout however, with 6 batters each having double-digit home runs this year, Oakland was the odds on favorite. Tim’s S.F. team barely edged out Davey’s Atlanta team in extra innings Sunday, 4-3. With Atlanta’s pitching staff worn thin, S.F. was able to manufacture a run with a suicide sqeeze in the 10th inning before retiring Atlanta 1-2-3 in the bottom half of the inning. This contest featured some stellar pitching with 13 combined strikeouts, with neither team reaching double-digit hits. 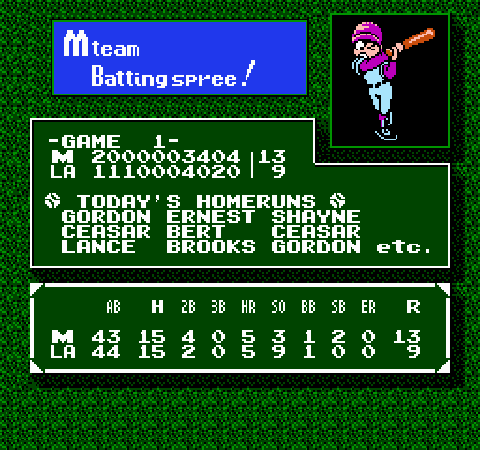 Tim’s L.A. team started hot, getting 3 first inning runs off back to back home runs by Rocky and Tom. However, starting pitcher Carlos was left in the game far too long, surrendering 2 runs in the fifth and 3 runs in the sixth before leaving the game. Fortunately, L.A. was able to creep back with a run in each of the last three innings, and hold on to win 6-5. Detroit’s pitching was masterful after the rocky first inning, striking out 7 L.A. players. L.A. will also need to work on their defense if they hope to win much in the future as they committed 5 errors in the field. You are currently browsing the Bad News Baseball blog archives for September, 2008.